This paper sets out some of the leading and fundamental e-commerce decisions John Lewis has taken and implemented across 2010-2011, decisions that have led to 25 consecutive months of outperforming online market growth as stated by IMRG. John Lewis is the UK’s favourite department store, a brand famous for its Never Knowingly Undersold commitment and for inspiring genuine affection in its customers. It has 35 shops, over 27,000 John Lewis partners and an award-winning website. It currently sells the biggest range of products of any UK high street retailer. In early 2010, John Lewis saw that despite having an incredible 350,000 product SKUs most customers visited on average only twice per year. It was also clear that there was significant potential to increase online annual sales by creating opportunities for customers to interact with the brand through new and multiple touch points. Indeed it was apparent that a multi-channel customer was worth on average 3.3 times more than a shop-only customer shopping on average 6 times per year. As a result of this, and the consumer trend for browsing and purchasing online, John Lewis refocused its strategy and made e-commerce growth its single highest priority, setting a new commercial objective to increase online annual sales from £393m in 2009/2010 to £685m through online channels by 2011. The journey so far has taken John Lewis from a department store with a mediocre online business to become one of the top e-tailers in the UK with online sales growing by at least 27% per year over the period 2010/2011. On the busiest day, johnlewis.com took an order on the website every 1.9 seconds. John Lewis also grew its multichannel customers in 2010 from 7.3% to 12.67% of the total customer base and in 2011 to 15.75%, an increase of 27%. 1. A fundamental change in its trading strategy – to be Never Knowingly Undersold - across multiple brand channels. 2. A determination to make John Lewis easier and more convenient for customers. 3. The development of compelling content to attract and reward customers as they engage with the brand through different digital channels. Never Knowingly Undersold has been John Lewis’s core trading philosophy since the 1920s. Part of Never Knowingly Undersold has been a proactive price matching promise that means John Lewis customers can shop in the knowledge that they cannot find a similar product with same price, service and quality anywhere on the high street. In September 2010 a key decision was made to extend Never Knowingly Undersold to apply to online sales. With a potential associated risk of £50m, this was a huge statement within John Lewis that e-commerce was of vital importance to its customers and to its brand and was a signal of a business determined to embrace it. The immediate effects of this new policy were shown in sales and market share, particularly within our Electrical Home Technology category e.g. white. Goods went from challenging year on year numbers to significant double digit growth. Below are outlined some of the key strategic initiatives which have helped to boost John Lewis profits and to enhance customer experience. 1. Fashion: an e-commerce success story. At the end of 2009 John Lewis re-launched johnlewis.com/fashion with a dramatic makeover proclaiming its ambition to rival the biggest online fashion retailers in the industry. Understanding that the majority of its female customers were shopping for home products online but not necessarily for fashion, there was a huge opportunity to convert an existing customer base that already loved and trusted the brand to a category which commanded higher frequencies and had huge sales potential. Since September 2009 John Lewis has focused on creating a user friendly, fresh-looking fashion category that appeals to a more fashion forward customer. Over 100 ‘brand shops’ were introduced selling a huge variety of products from Barbour through to Mulberry and Ralph Lauren to Diesel. Guest editors were commissioned to create inspiring catwalk trend previews and ‘Get the look’ guides to help provide an effortlessly enjoyable user-experience for customers exploring the range of over 300 brands. Innovative new online marketing programmes were developed including contextually linked advertising and the UK’s first geo-climatic banners for JL fashion. The results proved sensational. In 2010/2011 Fashion accounted for 25% of johnlewis.com sales. This financial year 2011/12 Fashion will end at nearly one third of the total sales due to the growth and success of the online offer. Fashion also accounted for more than 25 per cent of the total online profit in 2010/2011, up 7 per cent on the previous year. 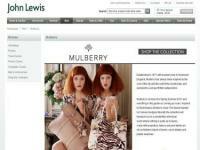 By the end of autumn/winter 2011 John Lewis had launched over 55,000 fashion products online. Johnlewis.com was now rivalling the ranges of leading pureplay fashion retailers. 2. Launch of facebook, Twitter and Youtube. In 2010 John Lewis launched channels on Facebook, Twitter & You Tube. Launching in October 2010, Facebook fans have grown to 339,085 today. Twitter followers have seen dramatic growth to 20,000 in the same period. Customers have used these spaces to form their own community backed by a customer service function ready to answer any questions they have. We have also offered ‘always on’ content to our customers promoting events around the country in stores, allowing customers to choose their charity of the month and welcoming guest editors from Grazia journalists to online bloggers hosting the page on key topics our customers want to hear about. Partners have also played their part by holding ‘surgeries’ on specific topics like new product launches and ‘how tos’. 4,085,250 views on YouTube, with 18,702 likes and 926 dislikes becoming the third most popular video on YouTube worldwide during launch week. John Lewis launched a competition called ‘Guess the gift’ in support of the TV advert whereby various children were filmed for johnlewis.com describing one of the top John Lewis Christmas products. Participating customers were asked to guess the identity of the product and, if they guessed correctly, were awarded the gift as a prize. The competition was promoted across all channels including Facebook, You Tube and Twitter with a phenomenal rate of entries and customer engagement. 3. Launching Click & Collect – a revolution of convenience. Launched in early 2009 this stress-free delivery option, available online, in shops and by phone allows customers to make an order by 7pm and collect their orders, from their chosen John Lewis store, from 2pm the following day. In 2011 John Lewis’ popular Click and Collect service saw nearly 1,500,000 orders processed. With over 150,000 products available for next day collection, Click and Collect now accounts for 22% of all orders (compared to 16% for the same period last year, Jan-Dec 2010). 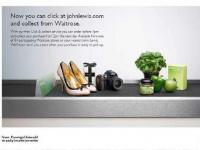 In October 2011 John Lewis extended click and collect to include an additional 94 Waitrose stores, adding significantly to the convenience of the service for customers. Waitrose deliveries now form 25% of all the orders which are placed through our click and collect channels. Another 100 are planned for this year given this success. 4. Redefining window shopping – turning windows into direct selling tools. In November 2011 John Lewis trialled a whole new dimension in ‘window shopping’. Customers passing a window display in Brighton Waitrose were encouraged to scan QR codes with their iPhones to purchase featured items via johnlewis.com mobile site. John Lewis also rolled out virtual window displays in seven shops for the duration of the clearance period, allowing the retailer, which does not open its shops after Christmas until 27 December, to capitalise Boxing day footfall. 5. i-Phone App: Shopping wherever, whenever. John Lewis continued its multi-channel approach with the launch of an iPhone app in December 2011, giving customers access to 200,000 John Lewis products while on the move. Since launch the app has been downloaded onto 120,000 smartphones and generated £130k of direct sales. 6. Free WiFi – A first for UK department stores. November 2011 also saw John Lewis become the first UK department store retailer to offer free Wi-Fi access to its customers. Accessing product information and viewing ratings and reviews to influence their purchase, customers are now able to surf all areas of the internet to compare prices, reinforcing John Lewis's pricing promise to be 'Never Knowingly Undersold'. It gives customers in all areas of John Lewis shops faster access to www.johnlewis.com and the internet than when using 3G. It also provides access to the John Lewis mobile site, including My John Lewis and the Wish List which will automatically sync between a customer's home PC and their mobile in-store. 7. Bringing Partners and e-commerce together - Partner Assisted Customer Transactions PACT. John Lewis now has over 300 customer self-service Kiosks and over 2,000 Partner assisted terminals in over 30 of its shops. This allows a customer to browse and buy from the website whilst in-store. It also allows partners to help customers if they are unfamiliar with the website thus bridging the gap between offline and online customers. PACT has been a huge success; sales delivered by the kiosks have increased 572% from 2010 to 2011. More fundamentally however, 25% of all new online customers in the first half of 2011 were recruited directly from PACT experiences in-store. Each shop now has a Digital Champion to help customers to shop online as part of John Lewis's commitment to Race Online 2012. 8. Aurasma in the brochures and Christmas Ads. John Lewis has increasingly integrated technology into print campaigns and catalogues to ensure the bridge between physical and digital worlds is ever smaller. Aurasma “The World’s First Visual Browser, bringing the physical and virtual worlds together” is an app available on smart phones that allows it to recognise images, symbols and objects in the real world, connecting the user with exciting online rich online content. In two short years, (across 2010 and 2011) from being considered a predominantly bricks and mortar department store, John Lewis has become a leading retailer in its use of e-commerce. A great many initiatives have been designed and delivered to help reach a wider customer set and facilitate their ease and convenience in accessing John Lewis’s unique assortment of products. But this is a story about so much more than just effective ideas and initiatives. This is a story about how e-commerce has been expertly woven into a traditional and long standing organization to work with its existing principles and structures to great effect. John Lewis haven’t simply added new technologies but rather embedded them. The brand’s founding principle (Never Knowingly Undersold) has been developed to make it apply to a new e-commerce structure. The brand’s biggest source of differentiation, its Partners, have been seamlessly brought together with e-commerce initiatives to deliver a combined and assisted shopping experience. 27% increase in the number of Multi-Channel customers over the period 2010/2011. Click & Collect orders in 2010 increased 120% vs. 2009 and 2011 orders increased 77% vs 2010. This accounted for 22% of all jl.com orders. Click and Collect services added to 94 New Waitrose stores which equated to £20m revenue in 2011/12 with Click and collect now accounting for 25% of all jl.com orders. Online assortment width grown less than 100,000 products in 2010 to over 200,000 end of 2011. On the busiest day, johnlewis.com took an order on the website every 1.9 seconds. In the busiest hour that climbed to 1.1 orders every second. We took over 245,000 orders from PACT which equated to nearly £25m million in revenue, a 6% per cent increase on last year. We took 38,000 orders via in store kiosks which was an increase of nearly 400% on the previous year. But e-commerce is about more than simply creating the channels and technology to help customers access John Lewis. It’s also about creating inspiring content that rewards customers when they visit John Lewis across all channels and cementing brand loyalty amongst new and existing customers for years and generations to come.